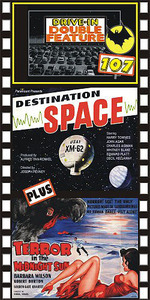 DESTINATION SPACE (1959) Harry Townes, John Agar, Cecil Kellaway, Witney Blake. Townes and Agar are the chiefs of a giant space station spinning through the heavens. As they prepare for a rocket launch from a nearby floating platform, a fiery meteor smashes into the station and cripples it! Townes is brought to task before a Senate committee that questions the wisdom of having such costly space projects. Later, in another launch attempt, an overload is discovered that will result in a nuclear explosion within minutes! A fine cast is helped along by a smart script. From 16mm. Plus: TERROR IN THE MIDNIGHT SUN (1959) Robert Burton, Barbara Wilson, Stan Gester. Scientists investigate the landing of an Alien spaceship in Lapland. The spaceship sliding in through the northern snow is well done and quite memorable. The aliens deposit a giant, furry monster that creates havoc with the locals. This original version is far better than the later released Jerry Warren hodgepodge, Invasion of the Animal People. From 35mm.